Umezono opened its doors in 1854 as a tea house in one corner of Baion-in, which means “Plum Garden Pavilion”, on the grounds of Sensoji Temple in Asakusa. The name “Umezono” is the Japanese reading of the Chinese characters “Baion”, and also means “Plum Garden”. Our founder originated and became famous for “awazenzai”, a sweet dish consisting of millet pounded into a glutinous mass that is shaped into cakes and covered in sweet adzuki bean paste. 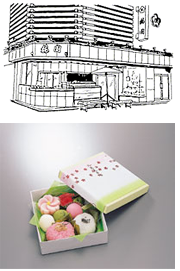 Awazenzai has been a favorite treat in Asakusa for 150 years. Another of our specialties is “shiruko”–mochi rice cakes in sweet adzuki bean soup–a traditional taste still enjoyed by visitors to Asakusa today. Kafu Nagai’s novel “Odoriko” or “The Dancer” (1946) contains a passage that goes, “I tried to get some shiruko at Umezono, but the place was packed and I couldn’t get in.” This illustrates how popular Umezono was in Kafu’s time, as it still is today, and as we hope it will continue to be for a long time to come.